New Workshops Booked- Stitches South, NOLA and Back to Holland! I’m so excited because this has been a very busy week for booking workshops! I have a bunch of new things on the calender that I’m very excited about! The first one on the schedule is coming up this April in Atlanta GA! I will be teaching my, Corespinning for Funk and Function workshop at Stitches South! I’m very excited because this is the first creative spinning workshop on the Stitches roster! I’ve gotten such a great response at my booth and so many people have asked me to teach, they are giving me a chance! SO- you asked for it, so please come spin with me this Spring! You can sign up at the Stitches South website! The bonus for this workshop will be added time spent on how to use these creative yarns and there will be patterns provided with samples available for discussion. I will be attending the SWAY guild Art Yarn festival, the weekend of April 19-21. The tentative plan is for me to teach Wild Fiber on Thurs or Friday before the weekend portion of the event begins. I will post more as the details firm up. Cost TBA, Students are encouraged to bring fiber to use and share with the group. The next new workshop on the schedule is hosted by Dream Come True Farm and Pam Blasko! June 15 (Sat) I will be doing a full day Wild Fiber workshop! We’ll be carding creative batts on multiple drum carders, carding rolags on blending boards, and combing and pulling roving off an art hackle. The next day is an optional Spin In where we will spin our prep’d fiber while sharing our tips and techniques in a communal learning setting. Cost for the Wild Fiber day is $100 plus $25 for a catered lunch and dinner. 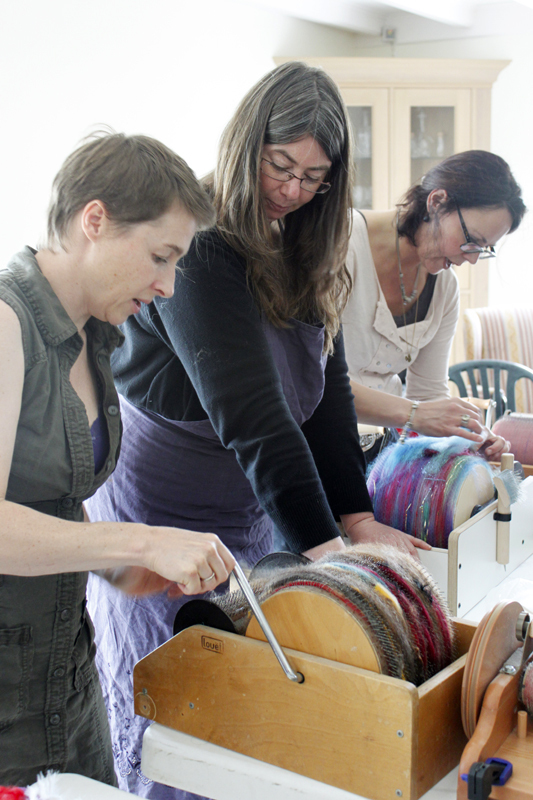 Spin In portion is free, but participants are encouraged to bring fiber to use and share with the group. Spaces are limited, so get your registration in as soon as possible. I am extremely giddy to be heading back to Holland so soon! The full details are yet to be worked out, but it looks like I will be giving 2 sessions- Friday June 28-Sunday June 30, and the second session beginning the evening of Sunday June 30 running through the next week. I will post as things are confirmed, but I can’t wait to get back to my friends across the Pond! I am thrilled to be heading up to our Northern Neighbors for the Twist Fiber Fest in Quebec, Aug 23-25. Friday I will teach my full day, “If you Dream It You Can Spin It” class. This class is a more advanced creative spinning class that focuses on the process of yarn design, from prep all the way to your spin. I’ll also be teaching on Sat and Sunday 4 short half day workshops, including Tailspinning and Wild Fiber Prep. I will post when registration opens and you can watch the Twist FB page for updates. I am SO excited to be heading down to the Gulf Coast to do a fun workshop with a lovely SAORI Studio about an hour north of New Orleans in Folsom LA. This is a special THREE day workshop , Friday Nov 15 through Sunday Nov 17. The first two days of the workshop will focus on creative fiber prep and spinning textural yarns that look especially spectacular woven. We will corespin and then add elements like elastic and wire to the cores, we will tailspin wild locky yarns, we will spin loopy boucle and other funky plied yarns. On the third day we will take these yarns to the SAORI looms of the studio and teacher/host Jenny Pelc will lead a day of weaving instruction. We will see how these techniques work with these creative and textural yarns. I will have the new Majacraft Dynamic Heddle Loom available for use as well. Accommodations are available onsite. Spaces are also limited so please see WeavinPlace for registration info. Finally the last new workshop is actually for next year! I have been booked to teach a 2.5 day workshop for the Tropcial Flordia Weavers Guild Annual Spring Conference, March 15-17 2014! This is a special comprehensive workshop called “The Journey Through Creative Spinning” and will be an inclusive workshop of creative fiber prep, and textural spinning techniques from corespin to tailspin, bobble to chain ply. Registration will open up next winter. There are still spaces available on the Friends and Fiberworks Fantasy Fiber Cruise July 26-Aug 1. Registration has also opened up for the Carolina Fiber Fest! I’m teaching there all weekend!! 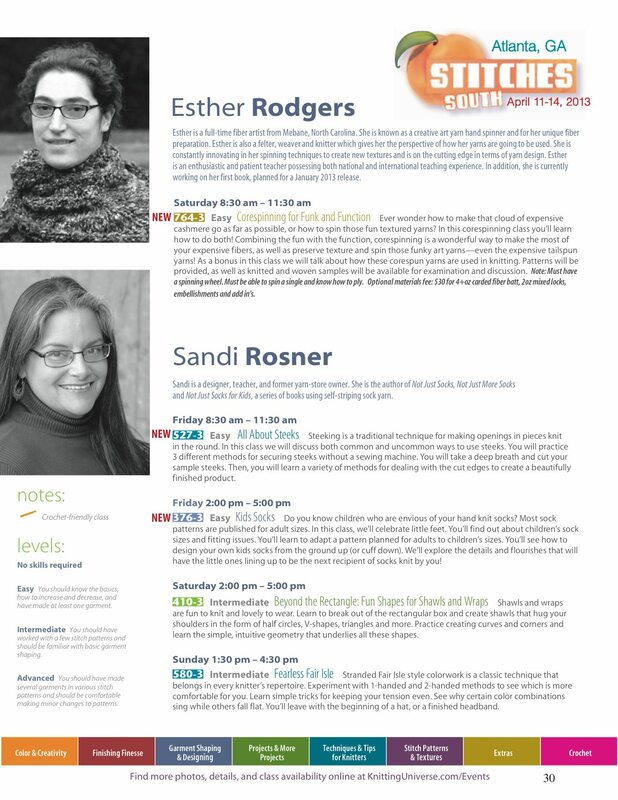 Of course I’ll be back at SAFF in the fall with some new workshops!! I’ll keep everyone posted as details are confirmed. Ayesta made a fantastic video highlighting the Holland workshop last summer. Check it out for a taste of the fun we have!! ← Leather and Lace Party this Weekend at Downtown Knits!